Fantastic, flavorful and fast with a hint of sweetness, this soup will warm you up on chilly days. Who doesn’t like a rich, flavorful hot soup topped with melted cheese and crusty bread? Always follow the procedures and safety precautions that came with your pressure cooker. Place butter in inner container of Instant Pot. Turn on the Saute button. Add onions, Richard’s Famous Garlic Salt, brown sugar, Worcestershire sauce and cooking sherry. Saute for 14 minutes, stirring frequently so the onions do not burn. Sprinkle the flour over the onions and sauté for one minute, scraping the bottom of the pot with a wooden spoon so the flour does not burn. Add broth, stir well, making sure the flour is incorporated, and then lock the lid on the pot. Set it to Sealing. Then on the manual setting, set for high pressure of 20 minutes. When time is up, quick release, using the silicone mitts and being careful not to scald yourself with the hot steam as it releases. Take the lid off and stir. You may add one tsp. of gravy coloring if you’d like a darker broth. Carefully sample a spoonful of soup…allowing it to cool a bit first and adjust seasonings if necessary. Ours was just right as this recipe is written. Set your toaster oven or oven to Broil. Ladle hot soup into oven-proof bowls. Top with a piece of toasted crusty bread, then place swiss cheese on top, then mozzarella, then a light sprinkling of paprika for color. Place under broiler about 3-4 minutes until the cheese melts and bubbles, but does not burn. 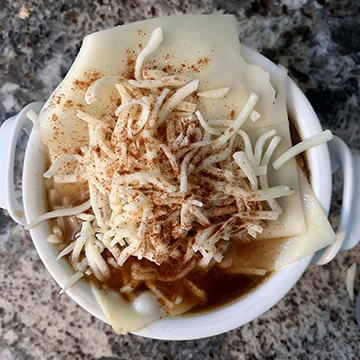 Instant Pot French Onion Soup Au Gratin. Enjoy! Carefully remove bowls with oven mitts and place on a plate—bowls are hot! Cool for a couple minutes, or until eating temperature, and then serve. Enjoy!